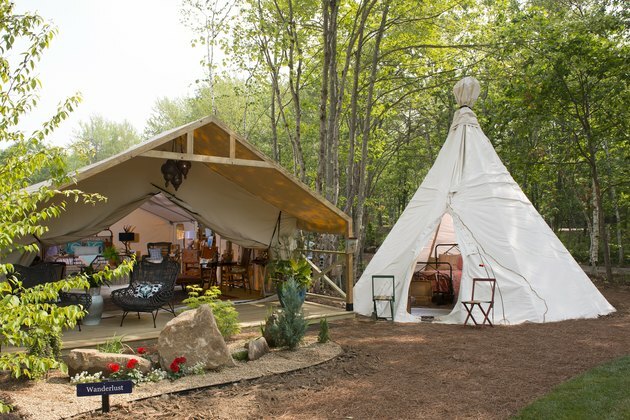 Blending preppy plaids with beach-chic colors and antler chandeliers, Sandy Pines Campground (which opened in June 2017) in Kennebunkport, Maine, is anything but campy. 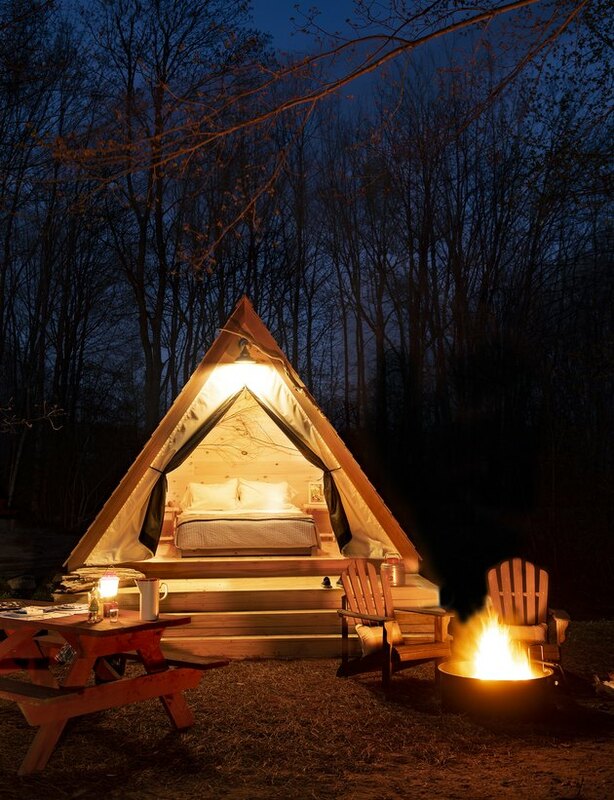 Instead of outfitting each hut and tent with the same decor, owner and co-founder Tim Harrington let a different designer loose in each 430-square-foot accommodation. 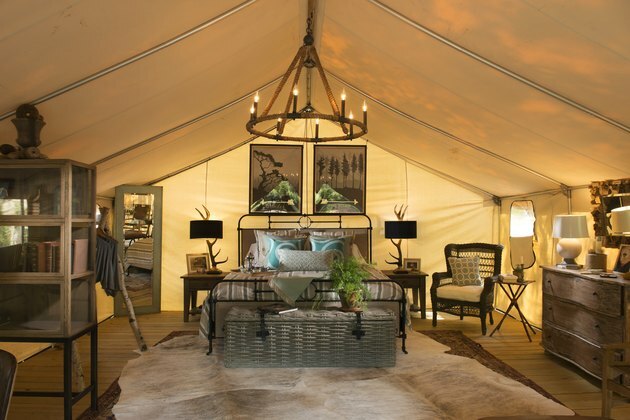 "Each designer was given one safari-style tent and free creative reign as long as the design included a king bed, seating area, and a few specific practical amenities," says Harrington. But even with this many designers, Harrington spotted a common aesthetic: "Sandy Pines' design is rustic, nostalgic New England that reflects what you'd see up and down the Maine coasts," he explains, "but with elevated, resort-level amenities." In transforming the former Salty Acres — badly in need of infrastructure upgrades — Harrington also drew upon childhood summers spent in Maine. Think movie nights, live music, lawn games, and kid-friendly activities, but with that elevated twist. He also looked abroad. 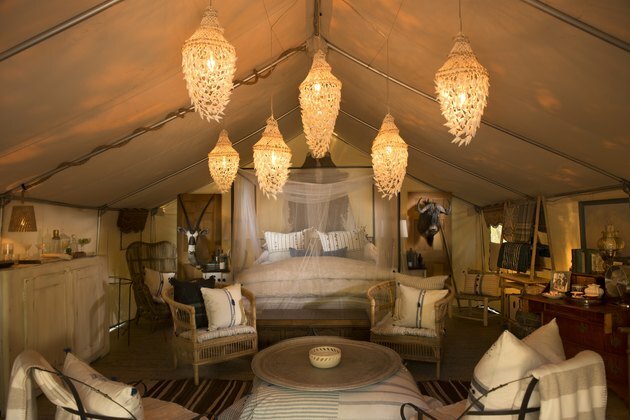 "I was inspired to create the new Camp Carriages and Hideaway Huts after researching what other countries are doing with small homes and camping sites," says Harrington. "There's a lot of interesting stuff coming out of the Netherlands and around Europe. These are our versions." Now, a sort of neighborhood exists at the campground, with the Grand Lodge and General Store along with a crafting tent for kids. In a nutshell, it's a place that "connects ... guests to Kennebunkport in a way that's truly Maine." 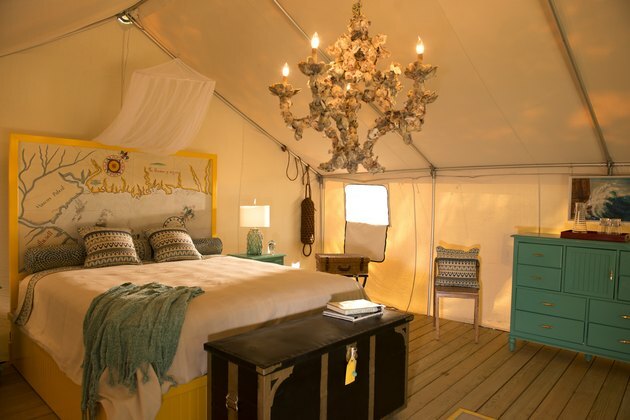 Moroccan-style pendant lights cast a soft glow on this tent designed by Nicola Manganello. 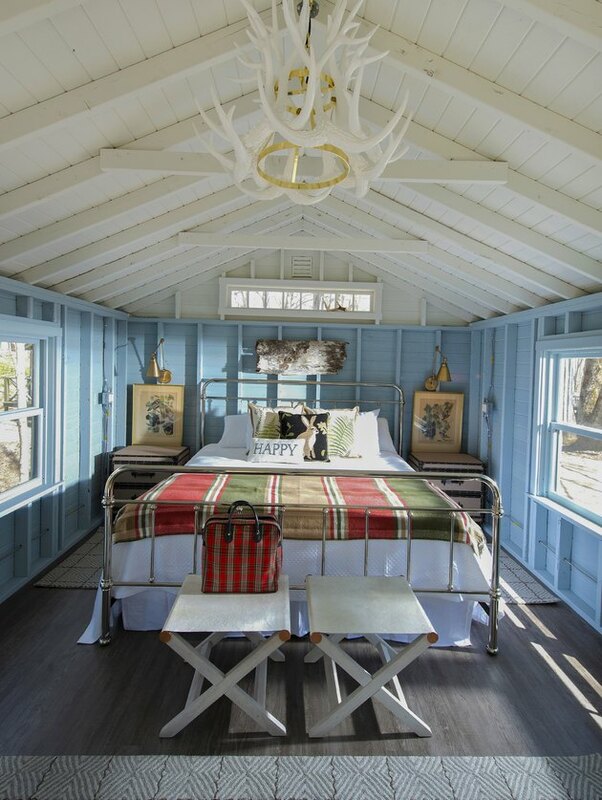 Nautical rope in the overhead light fixture, an iron bed frame, and glass bookcases create a timeless look in this tent, designed by Louise Hurlbutt. New this summer, the Hideaway Huts — designed by Krista Stokes — each include a comfy bed and transom windows that draw in natural light.